This bridal bouquet was placed on the head table in a gold vase. Many of the flowers were used as focal flowers in the installation at Mt Defiance Cidery and Distillery. A head table installation that rises above the wedding party. The Visit Loudoun wedding tour is held each Spring as a way for couples to connect with the incredible venues and vendors that exist within Loudoun County, Virginia. As a florist who serves Northern Virginia, Washington DC and Southern Maryland, we always get involved. We meet incredible wedding couples and their families while seizing the opportunity to get creative with our florals. This year's tour, on Sunday, March 11, was yet another opportunity to create floral installations in beautiful color combinations at some lovely local venues. The Cidery is a new venue in Loudoun County located in Middleburg, Virginia. We visited this beautiful new construction facility a few weeks before the tour and fell in love with the warm wood tones that the owners selected for the vaulted ceiling, bar and live edge tables. We selected a palette of peach and yellow flowers with darker greens to make sure that our flowers really popped in the design. If you are looking for a really unique focal element for your wedding, you could consider a raised installation like this one for the wedding party table. The flowers are visible here from all points in the room combining perfectly with low centerpieces. 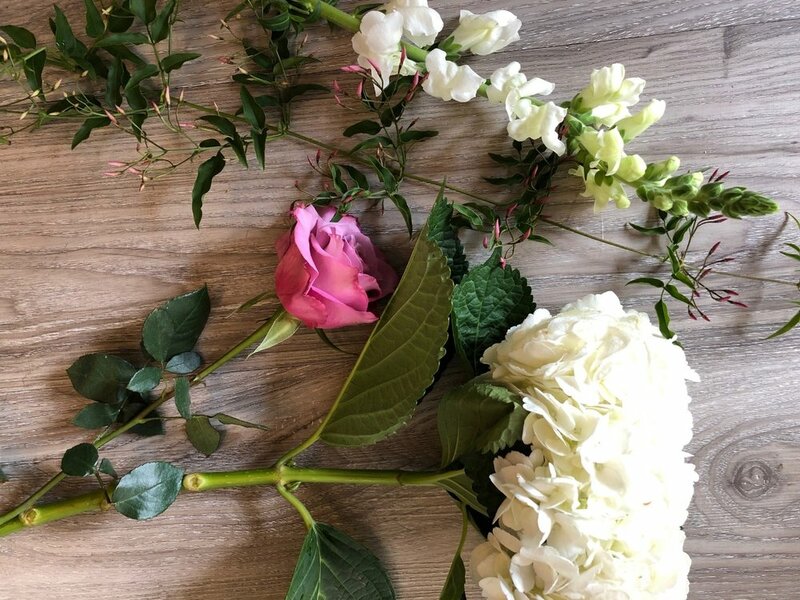 We used varieties of Garden Rose and standard Rose, Snapdrapons, Hydrangea, Orchids and Tulips with ample greens in quantities that you might find more affordable than you think. This raised design was created on a long plank that Sophia, our resident artist treated so that it had a bit of a rustic look well suited for the venue. Then, we secured all of the foam pieces to the top and bottom of the plank so that the stems would have a constant source of water. Quite a bit of the work is done in the studio, with final touches completed during delivery and set-up. This kind of design can be made to look a little more rustic or more luxurious with a higher floral count in a single color. A circular arch in pink and white at the Birkby House in Leesburg, Virginia. We love the look of a circular arch and are finding quite a few brides and grooms who feel the same way. The Birkby House in Leesburg is such a romantic place for a wedding. The venue is near the center of this thriving and historic community. Yet, when you enter the courtyard, you'll find yourself whisked away from the hustle and bustle of a lively small town to a place that is both timeless and elegant. Myriam and Heather wanted to demonstrate how Birkby's traditional arch could be designed to appear circular in shape. Deep pink, bubblegum and soft pink flowers are arranged with white and ivory stems and ample greens that look so pretty against the red brick. The mantle at Breaux Vineyards in Purcellville, Virginia. The mantle and fireplace at Breaux Vineyards is so lovely and expertly appointed. It requires little decor, especially if your planning to use your floral budget in other ways. Mantle decor is becoming more and more popular and we love the fact that you can use a feature like this to create a very impactful focal point in your reception space. Katie and Myriam planned the design in the studio, preparing some of the elements in advance. Then, Katie installed the main pieces and designed the rest on site to complete the look. Carlos found local Magnolia to add just a hint of warm brown to the display. The Delphinium (tallest stems) came in pieces that were nearly a yard high - quite remarkable. We are so lucky to have wineries like Breaux Vineyards in Loudoun County. It's a beautiful setting with excellent wine offerings. Tall Centerpiece at the National Conference Center. This simple but elegant, streamlined design greeted the couples who attended the opening breakfast at the National Conference Center. We loved the selection of silver and plum linens. 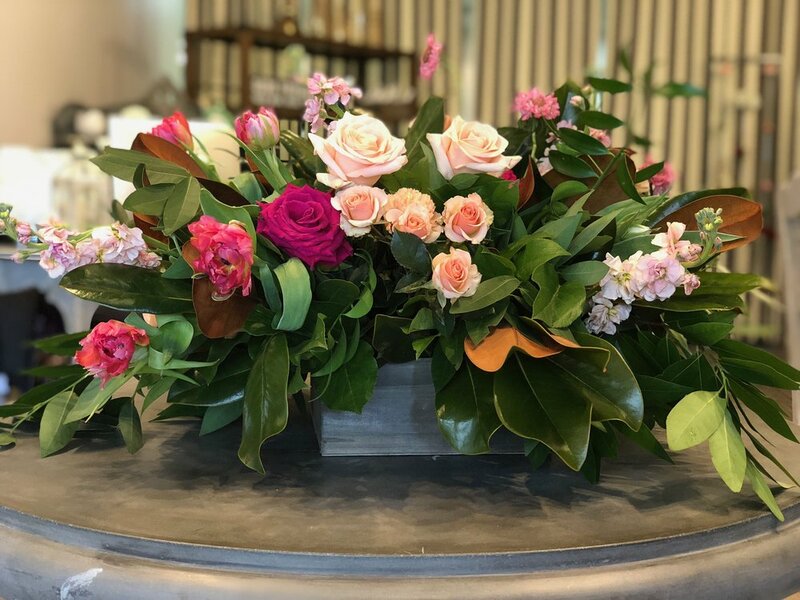 When the National Conference Center asked for plum accents in a tall design, we obliged with these Cool Water and Ocean Song Roses, a feathery, deep purple toned leaf called Agonis, and Jasmine with hints of pink and plum blooms. Purple Lisianthus blended the deeper colors with the white Snapdragons and Hydrangea. This is actually an affordable design for a tall centerpiece. It's light and airy compared to the more traditional rounded shape. This style adds interest to the room and with more space between the flowers, we see each bloom. We pulled these flowers for the National Conference Center when discussing their design. Clockwise you'll find Stock, Jasmine, Hydrangea, Cool Water Rose. 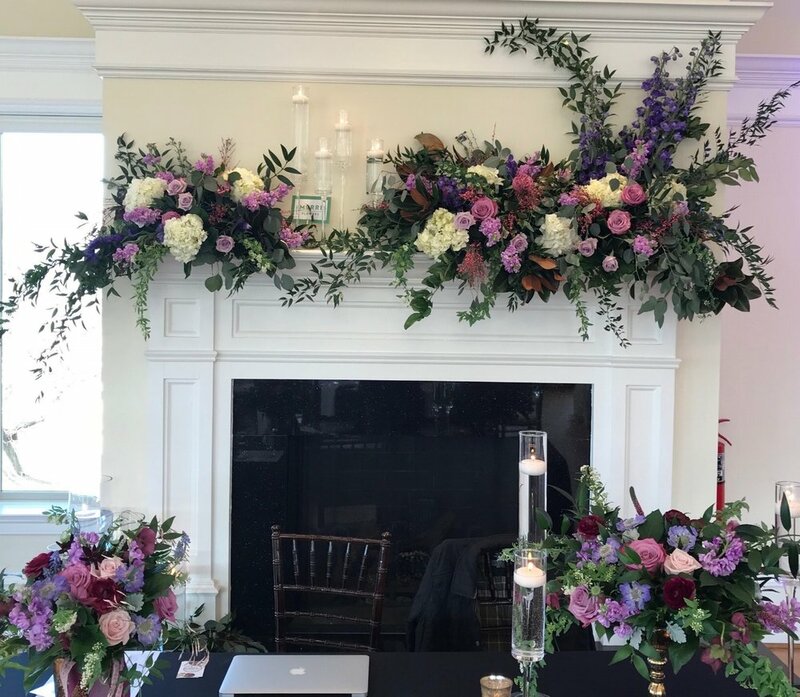 We also teamed up with Raspberry Plains Manor, Oatlands Historic Mansion and Lost Creek Winery creating color palettes and florals unique to each of these lovely Loudoun County venues.